Yesterday, I shared my Christmas Dining Room that was put together with thrift store, dollar store and discount store finds. The theme in the dining room is simple, casual, whimsical and nature inspired. I found this pine cone wreath at The Goodwill on half off day. It reminded me of a birds nest. Since I have little birds in the trees on the buffet, I thought it was a perfect centerpiece. I brought it home and removed the horrible bow. To mimic the look of a birds nest in a pine tree, I nestled the pine cone wreath on top of a fresh pine wreath in the center of the table. To give it graphic interest and a little bling, I stuck small white glittered snowflakes from the dollar store around the "nest". I placed a few red ornaments in the center to mimic a nest full of eggs. Melissa over at The Inspired Room creates a gorgeous centerpiece every year by placing various items inside a wreath, stop by and see what she did this year. Her wreath centerpieces inspired my birds nest, thanks, Melissa! Every time I visit a thrift shop, I look for red Christmas bulbs. I like to use lots and lots and lots of bulbs in my Christmas decor. I can usually find them 8 for $1. What I love about collecting them this way is the wonderful variation in finishes. It allows me to stick to one color without my decor looking flat. and placed them in a pair of large glass hurricanes from The Goodwill. Tomorrow I will share the details on my dinnerware along with tips on thrifting for dishes. I get all my Holiday decor form the Thrift Shop too! Isn't it so fun to put it all together? Yours look just so lovely, nice job! What a fabulous centerpeice!! I have three of those glass hurricanes and haven't done anything with them lately...thanks for the idea. Wow. I love. 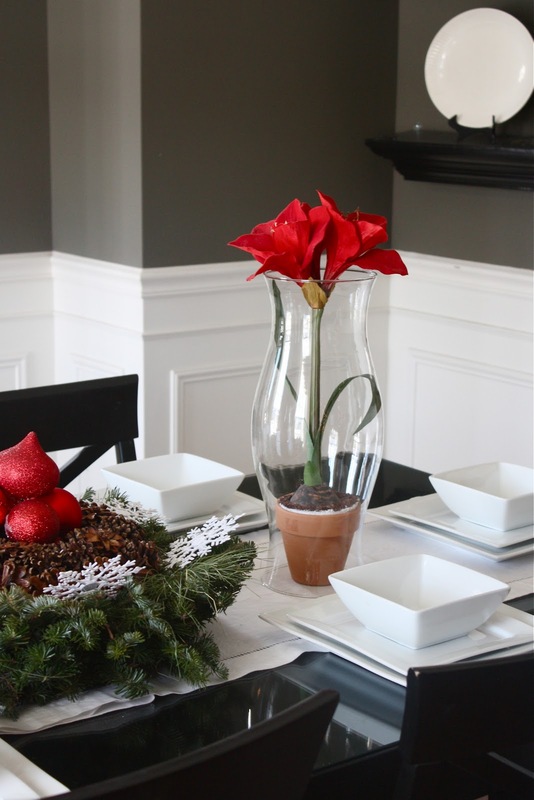 Great advice to always be searching for bulbs, and the pinecone wreath looks great layered. What a wonderful use of your glass hurricanes as well! Lovely! I love me some Goodwill! 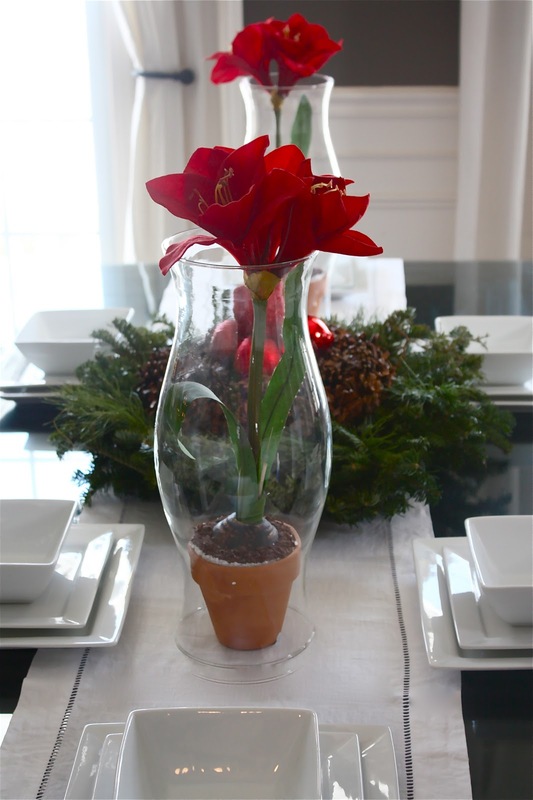 I find the best containers for Christmas giving and centerpieces at thrift stores- wonderful ideas. 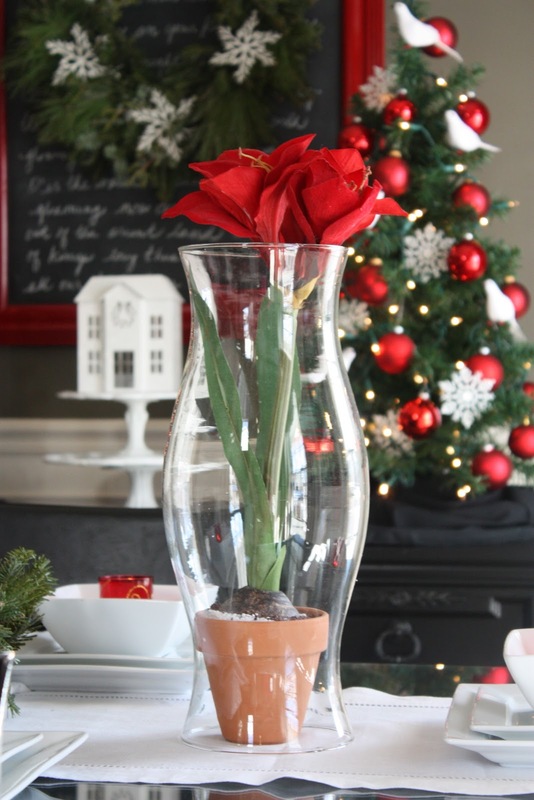 Such great ideas, so pretty and love that you use stuff you find at thrift stores too!! I love the idea of the birds nest centerpiece too, clever!!! Actually, that gave me another idea, ha! Ideas flow round and round! !